I’ve been on more than a dozen glaciers either climbing or traversing but there is one that stands apart that I’ve been waiting to explore. The Columbia. It’s big, hard to get at, surrounded by the biggest peaks in Canada and has no huts to make travel and exploration easier. Much of it is above 10,000 feet so it is hounded by bad weather most days. It is pocketed with crevasses and seracs. Naturally then, it is on every serious ski mountaineer’s list! I tried over the last two years to organize a trip up there but with no luck. At least I could recycle all the trip research! By chance, Emil returned to Banff from out west. 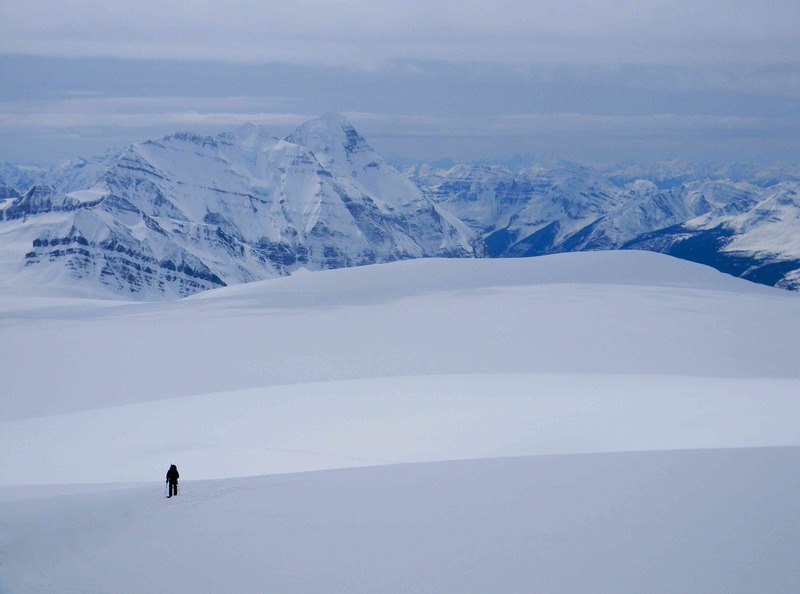 He and I did the famous Wapta Traverse together as well as the French/Haig/Robertson Glacier traverse. I asked him about Columbia and he jumped on board. 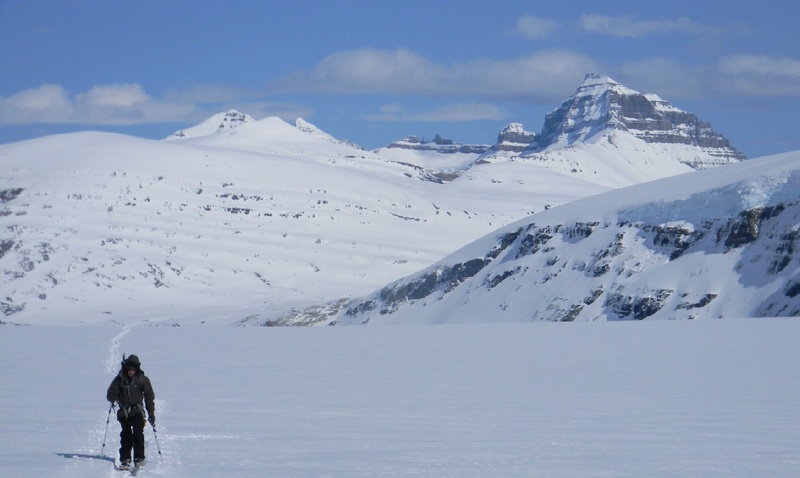 The big prize on the Columbia Icefields is Mt Columbia, the largest mountain in Alberta and we set our sights on it. Unfortunately, we couldn’t get anyone else to join us. A rope team of four people is really ideal for safety and three is okay so we talked about whether it was safe for just 2 people to try it. Rather than talk about it, we roped up in the back yard and practiced some rescue scenarios to see if a single person could extract the other from a crevasse. Using pulleys and our belay devices as motion capture systems, we decided that it was feasible. I would be taking my SPOT emergency locator device as well, but on the Columbia you have to assume that there are large blocks of bad weather where you are simply stuck there. We packed up and I was very nervous about the weight I would be carrying. Our first day would be a gruelling slog up the Saskatchewan Glacier over 18km with 4000 feet vertical gain in deep snow. I almost always have a pack on whether I’m at work or at play so being nervous about the weight is saying something. 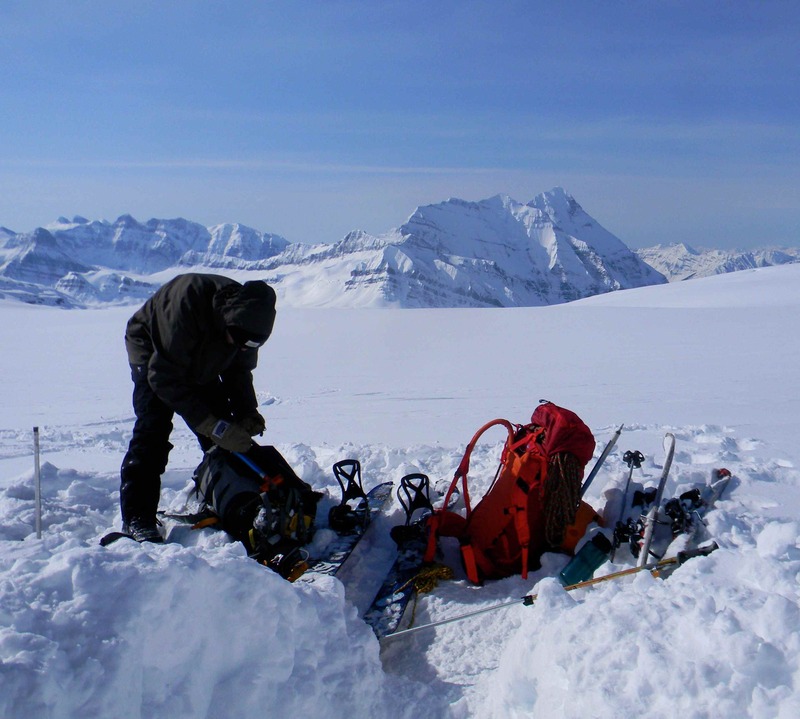 The list of absolute necessities included: tent, winter sleeping bag, thermarest, stove, pot, stove fuel, lighter, spoon, bowl, 4 suppers, 4 lunches, 4 breakfasts, extra socks, dry base layer, helmet, sunglasses, toque, light mitts, heavy mitts, ice axe, crampons, harness, glacier rescue gear (anchors, slings, prussiks, pulleys, biners etc.) 30m climbing rope, climbing skins, skis, poles, outer shell, avalanche beacon, shovel, probe, several litres of water, GPS, SPOT, camera, maps, compass, headlamp. The only luxury item was my camera and there was plenty I would have liked to have taken. Above: People talk about the road less travelled. But sometimes it’s not all it’s cracked up to be. After a week of preparation and planning, I left Canmore at 5:30am after a poor sleep. We drove to the hairpin corner just after Saskatchewan River Crossing and sorted out packs out. To our horror, we discovered that we had the tent but not the poles! Emil suggested we just dig snow caves for shelter. I had made one last year and thought it would be okay. It would just add to the adventure I guess. 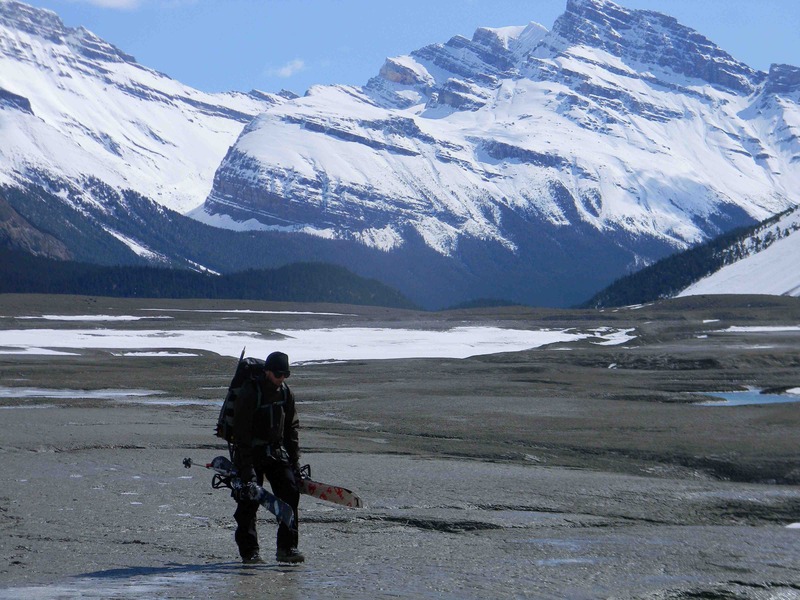 The valley floor had lost much of its snow so we carried our skis for the first bit as we hunted for a place to cross the North Saskatchewan River. A filament of remaining ice served our purpose and after we scrambled up the bank and hiked for a few hundred meters, we found enough snow to get our skis on. We were off! We followed the river upstream towards its glacier. Unfortunately, our snow ran out forcing us to pick our way through a boulder field (first picture above) and then a sea of silty mud (see below.) There’s always lots of energy at the start of a big trip so this setback hardly bothered us even though it was difficult to clean my boots enough to get them into my bindings! 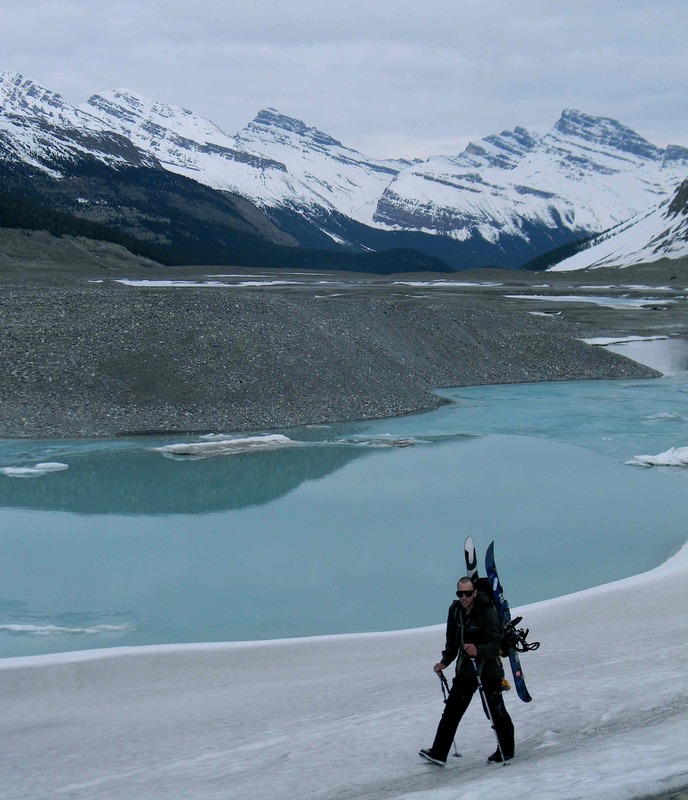 Above: Climbing up the massive Saskatchewan Glacier. It appears flat but is actually a significant angle. 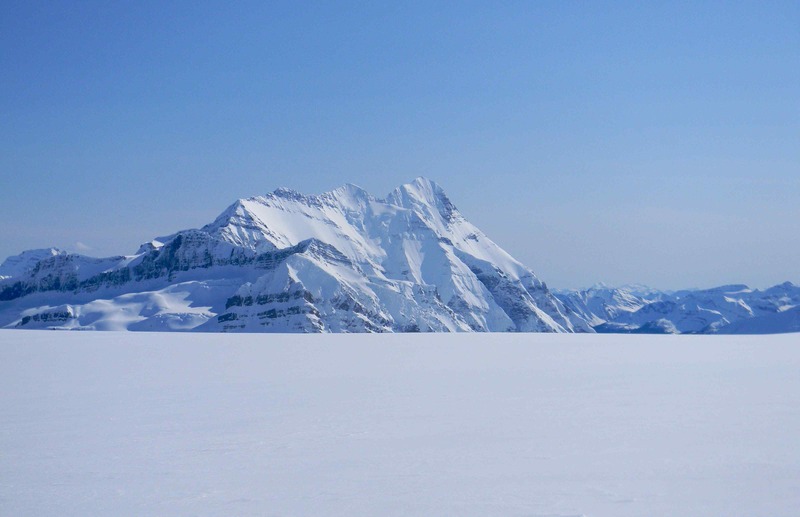 We are travelling unroped as this part of the glacier has no crevasses and the visibility is crystal clear. Being able to move without being roped is a real luxury in efficiency. There are always so many micro stops each person tends to make: adjust a strap that’s binding you, adjusting skis, grabbing a quick bite or drink of something, applying sunblock, taking a picture, put on on a layer, take off a layer. It’s only 10 seconds but when unroped, you can do your minor task without having to stop the other person. 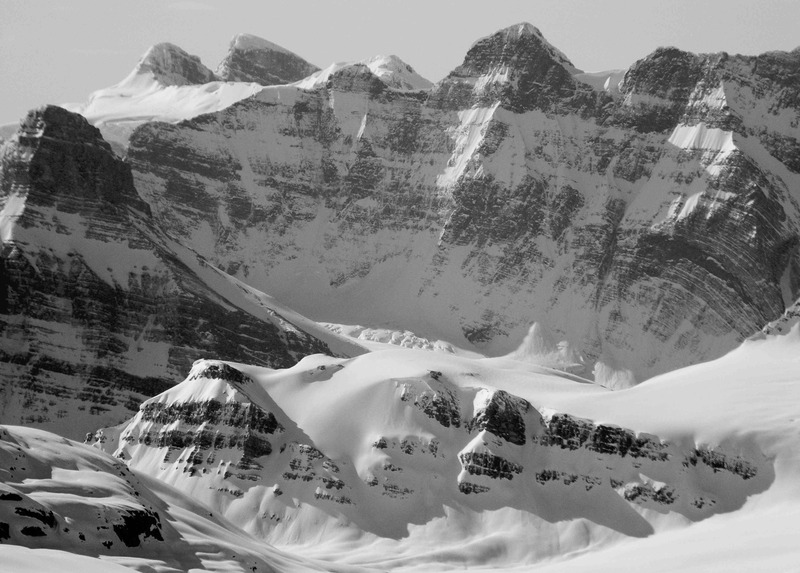 The Columbia Icefields are full of demoralizing views. The scale is so massive that distance get very distorted. 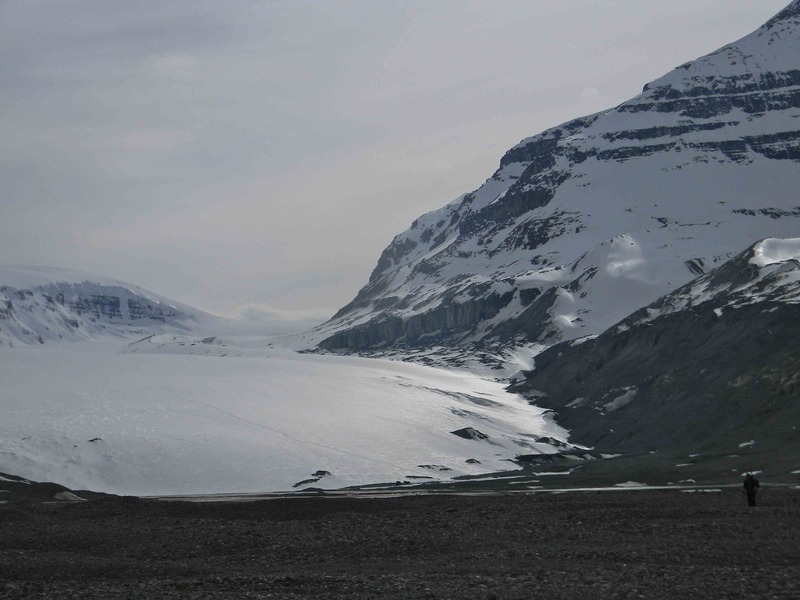 In the picture above, it took two difficult hours get to the icefall in the background. It was weird to see such huge mountains all around us and know we would soon be even higher than their summits. 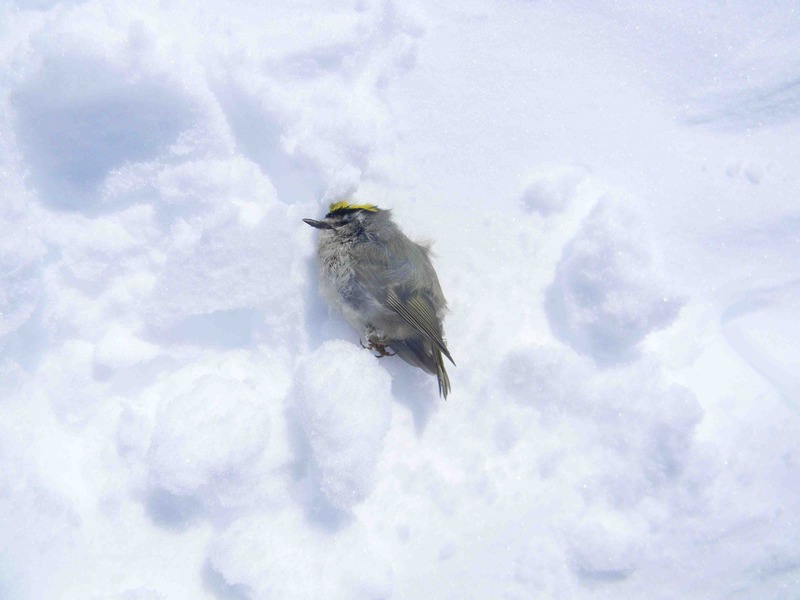 Above: We were very surprised after several hours up on the glacier to discover this expired, golden crested sparrow. Not sure what inspired him to make it up this far. A grim object in a sea of nothing. It often feels up in these places that you are not supposed to be there. The altitude, the lack of any living things, the harshness all conspire to say “please leave.” This dead bird reinforced that sensation for me. 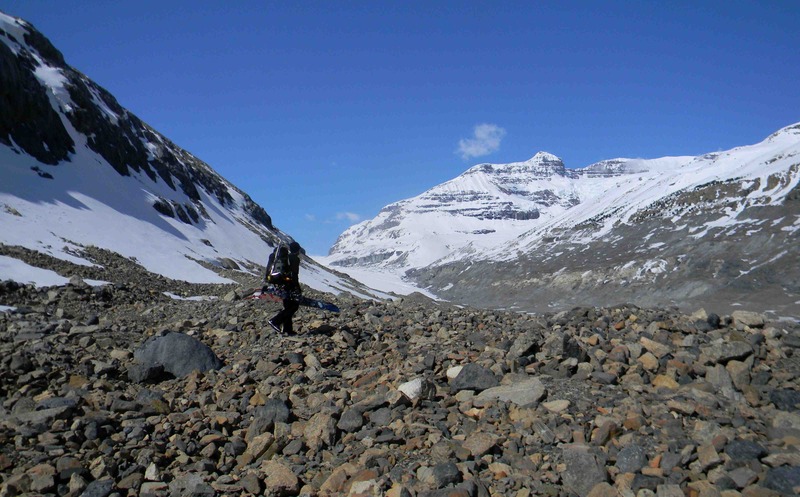 Above: Making good progress as we leave the Saskatchewan Glacier and climb up the Columbia Glacier. Mt Saskatchewan in the background is a fine looking mountain and just a few meters short of the exclusive 11,000 foot club. Above: Mt Bryce is the real eye candy on the Columbia. Its one of the tallest in the Rockies but seldom seen as it hides back here in the middle of nowhere. It appears to be rising out of a massive, flat plain but it is just a foreground roll in the glacier creating a false horizon. Above: While stopping for a bite to eat I saw this size 2 avalanche rip off this outlier of Mt Andromeda. We knew right away we wouldn’t be attempting the steep face of Mt Columbia tomorrow. 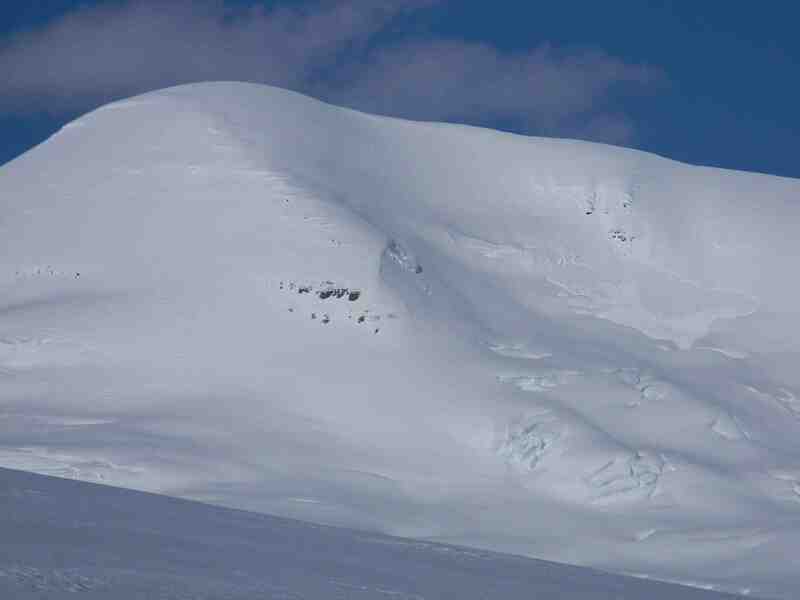 The clear skies meant the sun was heating the slopes and causing instability. Columbia would be safe if we could get up and down before the sun got at it, but it seemed to be too much to do in too little time. We changed our plan and decided to climb Snowdome instead which is not as steep. By 7pm we had gone as far as we needed to. I was pretty exhausted and a bit dehydrated. We started our snow cave by first probing out a safe area for camp. After digging out a trench and using our skis as rafters, we used the tent tarp for a roof and pegged it with out ski poles. 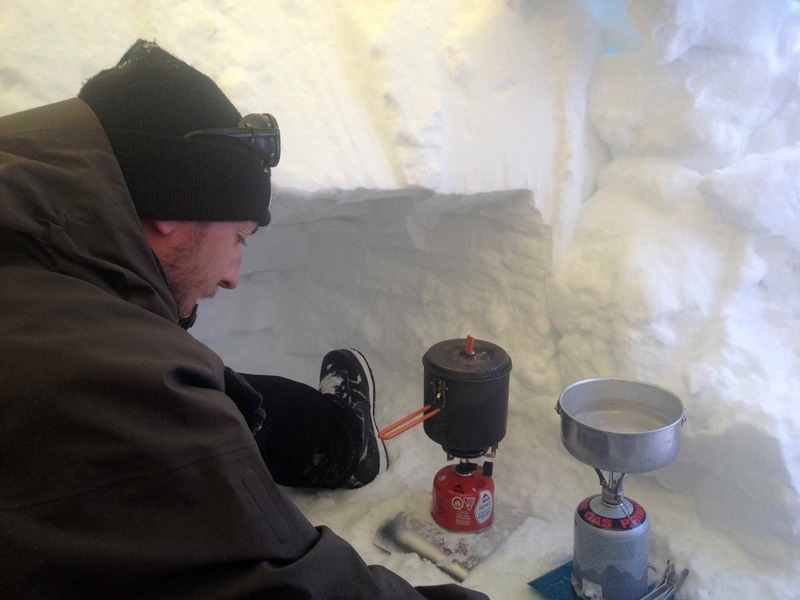 Above: Our snow cave was at just over 10,000 feet which puts the stoves to the limit of effectiveness. It took about an hour to melt ice for supper cooking and drinking. I had the shivers something awful (the temperature dropped to -15 as the sun set) so when the first pot boiled, I drank it boiling hot trying to warm up and thought of Shackleton’s expedition. I recalled reading about how they drank their tea near boiling all the time. Emil told some great stories of being in Ireland and visiting the pub once owned by Shackleton’s right hand man Tom Crean. The pub is a living museum of that amazing Antarctic trip. After some warm supper, we crawled into our sleeping bags and pulled the packs up to cover the door. In these conditions, you have to keep everything you don’t want to freeze in your sleeping bag. My boot liners, gloves, jacket and bottle of hot water rattled around in my bag all night for a pretty restless night. It’s a difficult routine in such a small space as you must be careful to not get snow on your sleeping bag. Above: My night was pretty awful but it wasn’t too cold. Our sleeping bags were quite damp on the outside. There’s a very fine line between ventilation and warmth that we didn’t quite master. During the night, cramps plagued me in such a small space after such a huge amount of work the previous day. But the sight that greeted us as we emerged from our hole in the glacier was breathtaking. It seemed so symbolic as if we had been birthed by the living glacier and popped out into the middle of nowhere. We probably should have left everything we didn’t need here and make a light climb of Snowdome but in such an environment, it is harder than you think to leave stuff that is essential to your long term survival. So we packed it all up and headed up to climb Snowdome. Above: Gaining elevation as we look out over the peaks of BC to the west. Above: Mt Alexandra, another 11,000er. The scale of these faces is truly amazing. There is a definite Himalayan quality around here. Above: The imposing and impressive East face of Mt Columbia. It’s about 10km away and you are looking at almost 3000 feet of elevation here. Yep, scale is crazy up here. We climbed up to the summit of Snowdome, my third 11,000er. The views are as good as you can find in the mountains. What makes it so special is that there are no mountains near it allowing an unobstructed panorama unequaled. Below is just beneath the summit looking west. It really feels as though you are on the roof of the world as the tops of the mountains lie beneath you stretching to the horizon. An interesting feature of this mountain is that it is the triple hydrographic apex of North America. Snow from this summit eventually melts into the Arctic via the Athabasca River, the Atlantic via the North Saskatchewan, and to the Pacific via the Columbia river. It is the only place on earth where water flows into three different oceans. We stood on the summit enjoying the fruits of our labour. I really had to push hard between the lack of oxygen and the heavy snow clinging to the skis. Each foot was dragging not just my big AT skis and climbing skins but 5 pounds of snow. With my pack it’s a big load to drag up 11,500 feet in the air! With such astounding views, it’s hard to leave but I could see bad weather rolling in. With so little for visual landmarks and massive crevasses everywhere, whiteout navigation is scary to impossible. If we didn’t get off the glacier today, we would likely be stuck out there for days. Being stuck in another snow cave for a few days didn’t seem very pleasant given the dampness of our sleeping bags. If we were forced into it, we would have spent the time to make an amazing snow cave and been okay. But we decided after five minutes on the summit that we would try and get off today. Skiing off the summit is an experience I won’t forget. Already the visibility made the snow hard to see and the slope angle impossible to read. The entire field of view was rank after rank of mountains as far as the eye could see. 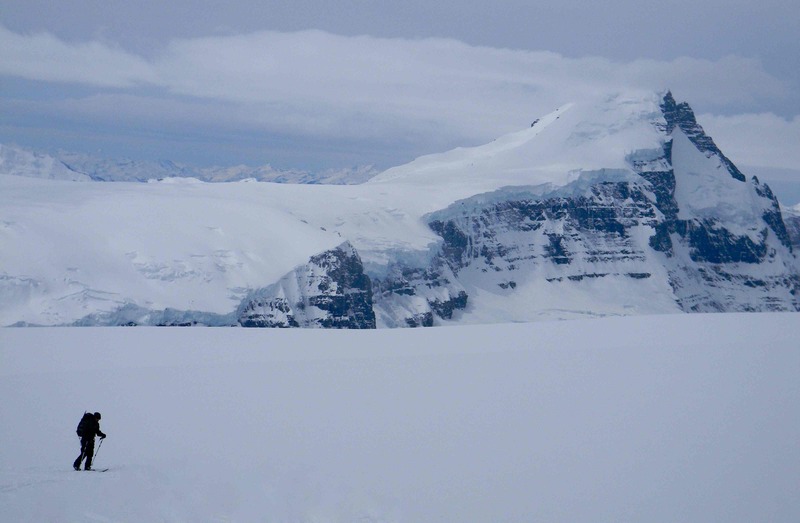 A quick descent of two thousand vertical feet had us back on flatter terrain of the main Columbia Glacier. At 5pm we took our first step off the Saskatchewan Glacier on to the mudlfats that marked the start of the North Saskatchewan River. To our disappointment, the warm weather had melted back much of the snow we skied in on. Above: Stepping off the glacier and navigating through the maze of mud flats, moraines, melt ponds and braided gravel beds. The road is at the base of the background mountains on the far right. 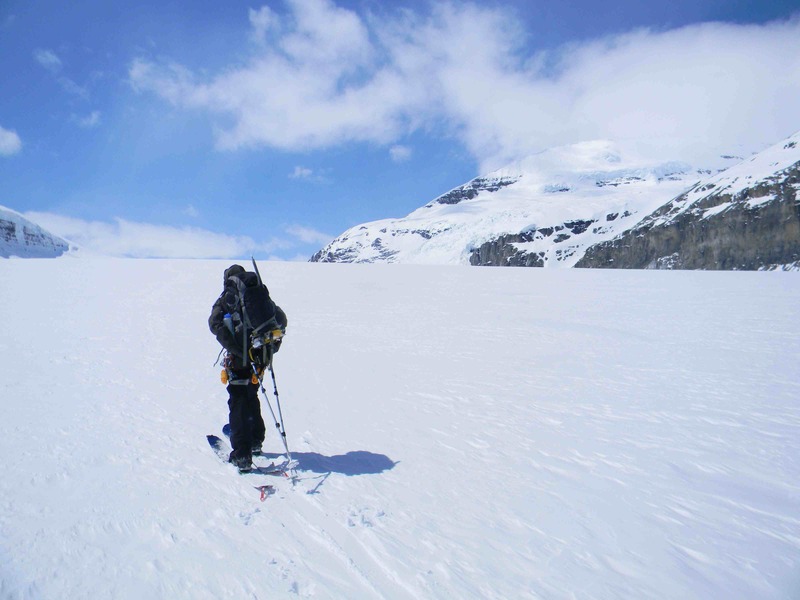 We were very tired and very dehydrated so to carry our skis on a lengthy journey seemed a cruel reward but there was nothing to do but soldier on. Above: When I get really, really tired, I find I can’t talk or think of anything distracting. All I get focused on is putting one foot in front of the other. Do not break the slow pace just keep going. Walking through these rocky channels in my ski boots with my massive pack on tired legs sent me into full coping mode. We didn’t walk together or talk. We both retreated into our own world of keep going. 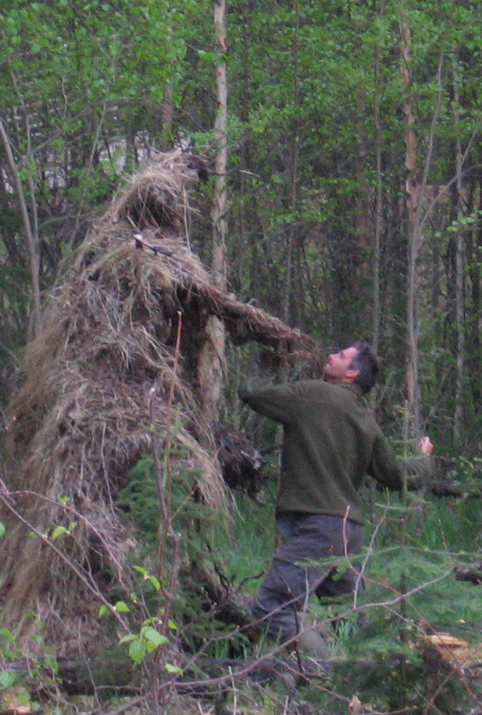 In spite of these tactics, I did turn around the odd time and took this picture which for me describes the scene well. 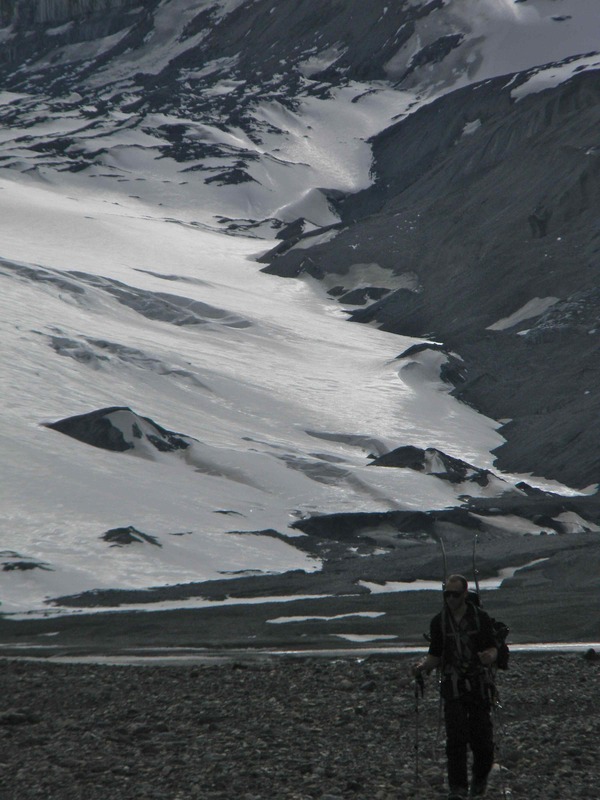 A blurry figure with our visible tracks leading up the middle of the glacier to infinity. Our epic stumble through the rocks lasted several kilometers. It was incredible how much had melted in two days! 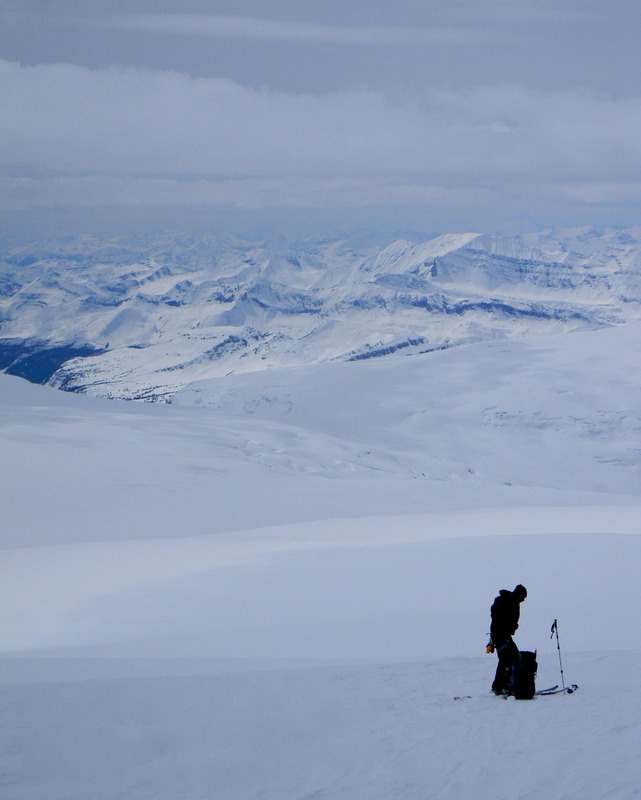 We eventually found snow and with great fanfare pulled our heavy skis off our packs and put them on. Our thirst was as profound as I can ever remember but the glacier runoff was so cloudy with silt it didn’t seem palatable. So when I stumbled on a side creek with clearish looking water, we threw off our packs and each drank two litres in the span of ten minutes! We threw in some rehydration salts to help our rehydration. We should have stopped hours ago and got our stoves out on the glacier and melted some water but we were so determined to get down we kept putting it off. The last obstacle was crossing the North Saskatchewan river. Given the melting we were worried that our ice bridge wouldn’t be there forcing a lengthy detour to a bridge downstream. Emil said he didn’t care if it was there or not, he was going to walk across. By great fortune, as we descended the river bank, we saw the ice still spanned the river in that one solitary spot. We dragged ourselves across with as much care as we could ready for a wet surprise but the fates rewarded us with a safe crossing. Five minutes later we were at the pavement shaking hands and congratulating ourselves as the darkness settled in. There was plenty to learn up here. On the drive home we reviewed the decisions we made and what could have been done better. We felt like we had just passed our intro course to this area. We made good decisions and saw astounding things that so few get to experience. As always, I am so grateful for such reliable and worthy partners who make these explorations possible and enjoyable. 1 Response to Hail Columbia! Attention Roofing Companies – Your search for accurate hail damage leads is over, at stormplotting.com you will have access to unlimited nation wide storm maps and address tracking information that allows you to print you list of leads.